I am happy with the texture of the cake , of course there is so much improvement compared with the last chiffon cake I made :) The most important factor to remember when making chiffon cake is not to deflate the egg white when folding into the batter and to straight away invert it the moment it is out of the oven. I will be making more chiffon cakes in the coming days as I know chiffon cake is much healthier than butter cake. Due to the lightness of the cake, one can eat a few slices at one go, which I did! Especially the orange scent is so refreshing. Preheat the oven to 325 degrees F (170 degrees C) and have ready a 10 inch (25 cm) two pieceungreasedtube pan. Pour the batter into the ungreased tube pan and bake for about 55 to60 minutes, or until a wooden skewer inserted into the center of the cake comes out clean. (When lightly pressed, the cake will spring back). Immediately upon removing the cake from the oven invert (turn upside down) the pan and place on a bottle or flat surface so it is suspended over the counter. 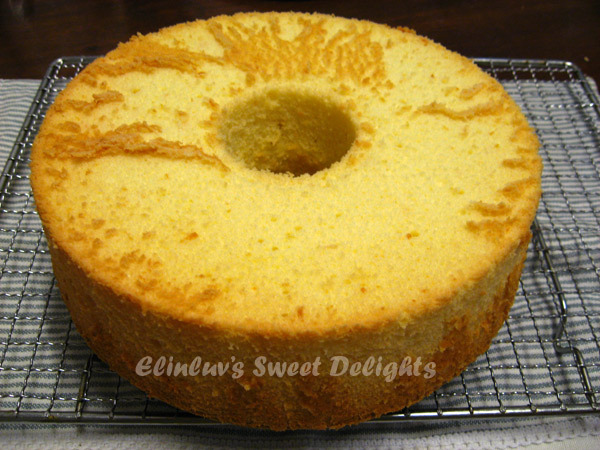 Let the cake cool completely before removing from pan (about 1 - 1 1/2 hours). 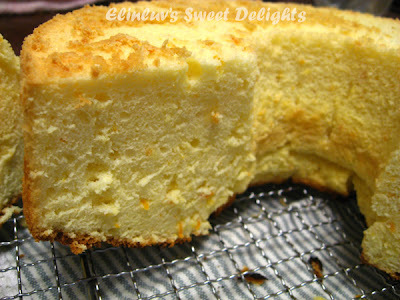 Orange chiffon cake is one of my fav! 1.5 cups sugar does sound too much for my tastebud too. Yummy!!! See you on Thursday! Nice bake, Elin! I love chiffon too, it's light and can eat a few pieces in a time. I would like to try this orange flavour next time! 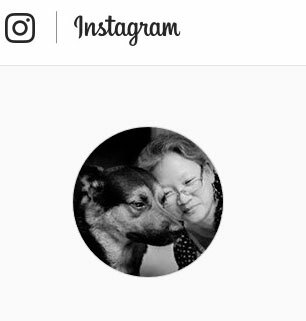 Elin, I think we ladies worked harder on labour day compare to normal days. Right! haha.... Too many baking & cooking to do.lol! How to get a good rest! 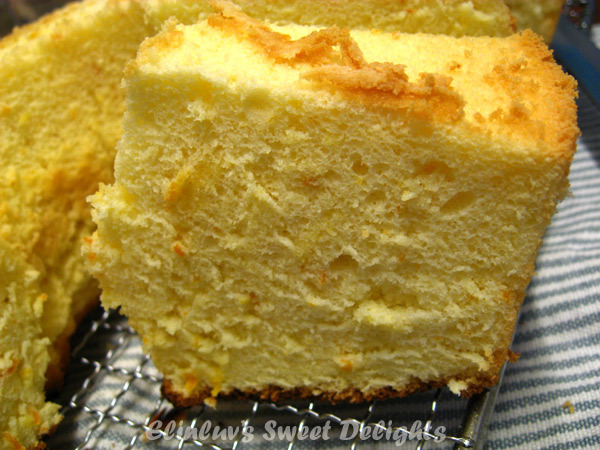 Soft and fluffy chiffon cake there ! Doesn't look like a 2nd attempt at all. I am sure there will be many more other favours to come now that this bake is such a success ! 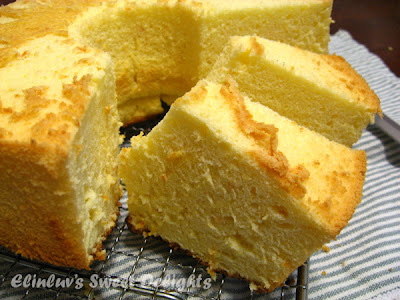 I see a revival of the classic chiffon cakes lol! many bloggers are baking this light and fluffy cake! Yours look super good! Can't believe you only baked it the second time! if you never tell, i cant believe that this is your 2nd attempt. Folding egg whites is my greatest fear of making a chiffon cake!